Have you been to an authentic Italian restaurant lately? Ever had authentic Yucatecan food? In the mood for authentic Cuban lechón? Every time I see or hear the word ‘authentic’ used to describe a cuisine I can’t help but to have a slight smirk on my face, because, simply stated, when it comes to the creation of a cuisine, this category is especially… well, how shall I put it? Slippery! Even the notion of a ‘national cuisine’ is misleading. And no other cuisine on this side of the globe manifests this falsehood than Mexican. After European colonization, and with subsequent demographic shifts caused by massive migrations in the 19th and 20th centuries, culinary dishes were the first to bear the imprint of transculturation (when cultures change due to the influences of other cultures). With this convergence of influences coming from different directions, how could Mexican cuisine not be a product of ‘fusion’,… then and now? For that matter, how can any country who has experienced the ebbs and flows of foreign conquests and migration throughout its history boast of an authentic cuisine? So why bother describing food as authentic? Because it essentially serves as a clever marketing strategy! 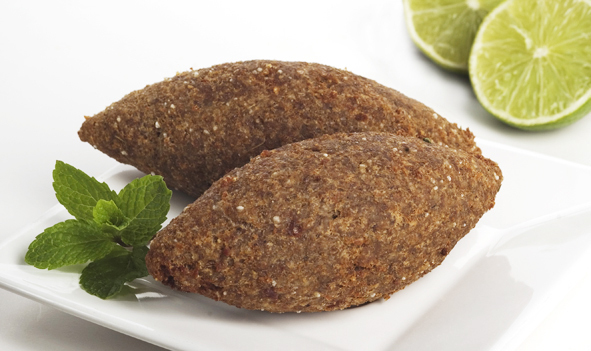 The lebanese-inspired Kibbeh served in Mexico. In Yucatán, where the Lebanese influence is most visible, you can ask for Kibbeh (or ‘kipe’ ‘kepe’ as streets vendors pronounce the Arabic word in Spanish), which are little turnover-like fritters, made with minced ground beef, chopped onion stuffed into a bulgur dough and fried. Other dishes include what is commonly called “Taquitos de Parra” (‘parra’ is the Spanish word for grapevine), which consist of grape leaves (later to be replaced by the cabbage leaf, since grapevines are hard to come by in southern Mexico), stuffed with ground meat, rice, and garlic, and sometimes even a little cinnamon. This dish brings memories of my own childhood, when my aunt, from the northern state of Chihuahua, would prepare a dish she conveniently called, “rollitos árabes”. These “Arabic rolls,” which were very similar to the ‘tacos de parra’ described above, consisted of ground beef, rice, mint, pine nuts, each wrapped in a steamed cabbage leaf and sometimes baked in a little broth. They were tantalizing morsels that fused Middle Eastern flavors with my aunt’s northern Mexican style of seasoning food (‘el sazón ‘ as we say in Spanish). Years later, as I became interested in the history of food, I realized variants of her dish are common in countries such as Hungary, Russia, and Greece. In Puebla, the Lebanese influence is most obvious in creations such as tacos árabes, which are essentially a version of the Middle Eastern shawarma, and usually made with marinated pork prepared on a spit and sliced into a pan árabe (pita bread) or a thick flour tortilla and topped off with slices of onion, and a red sauce. Other Lebanese dishes enjoyed by Mexicans are ‘jocoque’ , a type of strained thick yogurt used for dips and sauces, and Fatush or ‘ensalada árabe’, a green salad with lettuce, parsley, cucumber, pieces of toasted pita bread, and sumac. And, of course, there is also a historically older pastry, Marzapán, the almond paste dough so common in central and eastern Mexico, thought to have been created by the Arabs whose presence in Al-Andalus in southern Spain took place between 711 and 1492. In Mexico City, el Centro Libanés is a private organization sponsored by and serving the Lebanese community in the city. There is a wonderful restaurant open to the public that serves delicious Lebanese dishes, ranging from tacos árabes and lamb to a very impressive assortment of Arabic pastries. If you visit Mexico City, I highly suggest you pay them a visit to not only learn about the Lebanese presence in Mexico, but to have a taste of one of many versions of Mexican ‘fusion’ cuisine!